Seriously, people, why isn’t baijiu better known in this country? The Chinese beverage is the highest-volume distilled spirit in the world—mainly because the size of the population of its country of origin. But there are more people in the U.S. who have tried Italian grappa or at least know what it is and that stuff generally tastes like furniture polish. Anyone who says the same about baijiu hasn’t really tasted baijiu. To be sure, baijiu is pretty strong. Baijiu’s usually at least 100 proof (50 percent ABV, about twice the strength of Japan’s shochu) and often as high as 120 proof (60 percent ABV), but what struck me the first time I sat down and participated in a serious tasting of it, was how little the alcohol dominates the flavor. I’ve detected notes of everything from pineapple to rice vinegar among the baijiu expressions I’ve experienced and never once did I feel like my nose was getting smacked with huge wave of ethanol. 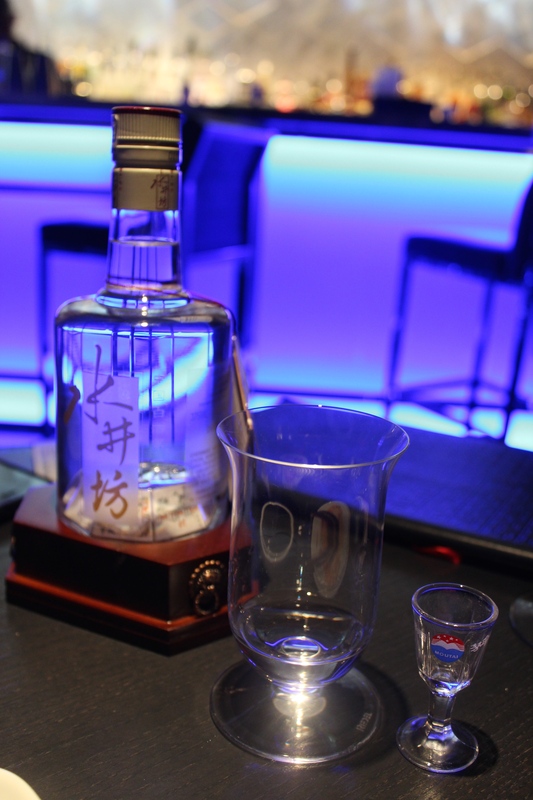 And as high-proof as it is, baijiu is very much a spirit of moderation. The tradition stemmed cup from which it’s consumed holds only a half-ounce (granted drinking sessions tend to involve multiple servings, but if you’re good at math you can stay sober). I’m grateful to Yuan Liu of Los Angeles-based baijiu importer CNS Enterprises, who was generous enough to spend a Friday happy hour educating my wife, Craige, and me about this remarkable, centuries-old tradition. At a corner banquet at Hakkasan in Beverly Hills, we paired some rather upscale dim sum with straight baijiu, as well as some of Hakkasan’s mixological innovations—particularly, the Eastern Elixir, which combines the base spirit with Aperol, coffee syrup, fresh tarragon and coffee syrup. It’s amazing that even when combined with multiple ingredients, the baijiu asserts itself and never lets the drinker forget that it’s the one in charge. I tend to preface spirit recommendations with, “It’s not for everyone” (especially when I’m talking about stuff like Fernet). I won’t, however, say that about baijiu. Baijiu has so much character and complexity and so much flavor variation brand to brand that it would be difficult for adult beverage enthusiasts to not find one they like. A millennium’s worth of Chinese tradition can’t be wrong. Previous Post Rick Steves Calls Out the Go-Nowheres!